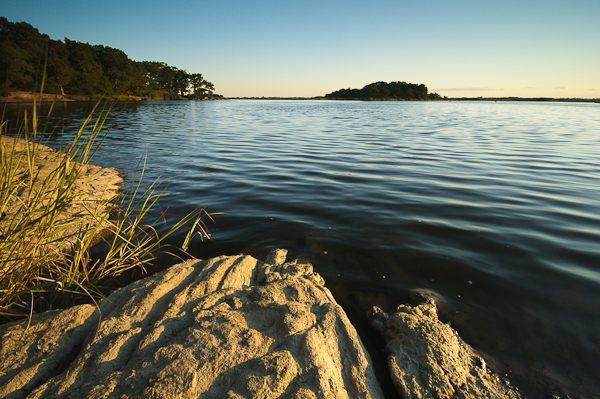 In 1988, the Old Lyme Land Trust established a 25-acre preserve in Old Lyme, Connecticut along the Duck River, a sluggish waterway that courses through generous swaths of tidal wetlands before emptying into the Connecticut River some two-and-a-half miles from Long Island Sound. The official name of this protected land, ‘Elizabeth B. Carter Watch Rock Preserve’, is quite a mouth-full, but it pays homage to an important conservationist and resident of Old Lyme that passed away in 2004. Unlike Bluff Point State Park in Groton, which is arguably the last remaining shred of undeveloped seashore in Connecticut, Watch Rock Preserve is not a “shoreline” property in the strictest sense; there are no beaches and the view of the Sound is obscured. But Watch Rock is undeniably “coastal”, as evidenced by the swaying marsh reeds, the smell of salt air, and the water levels that rise and fall effortlessly with the tides. Indeed, this an exceptionally rare habitat to have been preserved as natural open space. As early as the 1930s, the State of Connecticut was beginning to acknowledge just how much damage had been done to wildlife as a result of wetland destruction. Since those early days, much more consideration has been given to the importance of preserving both inland swamps and coastal marshes. Even still, when the Old Lyme Land Trust rushed to purchase Watch Rock, it was largely in light of the fact that the Locktite Corporation had been planning on developing the land as the site of their company headquarters. If things went just a bit differently, the only visitors to Watch Rock these days might have been wearing ties, carrying briefcases, and “hiking” down corridors lined with offices. Businesses are not the “enemy”, of course, and they shouldn’t be expected to search high-and-low for some sort of blighted, unwanted space before they feel justified in building their offices and factories. At the same time, Connecticut residents have understandably become more and more alarmed at the rate at which Connecticut’s natural places are disappearing beneath suburban sprawl, industrial zones, and storefronts. In the case of Watch Rock Preserve, nature has prevailed. But the scenario that led up to its preservation is one that will undoubtedly become commonplace as time goes on. Connecticut, and the United States at large, will be faced with many tough decisions in the future as to how the ever-growing needs of habitation, commerce and industry will be balanced with the health and well-being of the natural environment. These two considerations seem, in many cases, to exist in direct opposition to one another… and this issue is made even more complicated by the fact that both are of immense importance to our society. But while uncertainty may characterize the future of many natural places in Connecticut, one thing is for sure: the osprey will hunt, the blue crabs will scour the shallows, and the calm waters of the Duck River will forever flow silently beside the trails of Watch Rock Preserve in their slow advance towards the ocean. (Photograph of Watch Rock Preserve may not be reproduced or distributed for any purpose without the express written consent of Trails of Freedom, LLC).